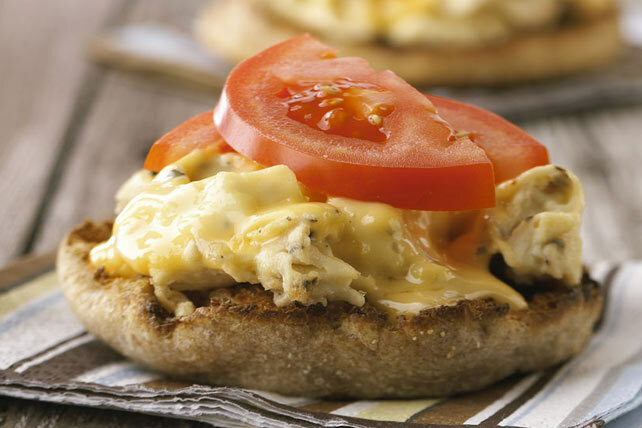 Quick Egg and Cheese "Muffin-wich"
Skip the drive-thru and have a fast-food favourite at home. Our Quick Egg and Cheese "Muffin-wich" is made in minutes - this breakfast sandwich recipe will get you out the door in record time. Beat whole egg, egg white and basil in small microwaveable bowl with whisk until blended; cover with paper towel. Microwave on MEDIUM-HIGH 1-1/2 min., stirring every 30 sec. Let stand, covered, 30 sec. ; spoon onto muffin halves. Top with Kraft Singles and tomatoes. Choose a good quality microwaveable container. Round shapes work best for cooking eggs in the microwave. Since eggs cook quickly in the microwave, they can easily become tough or overcooked when microwaved. To avoid this, use MEDIUM-HIGH or MEDIUM power settings for egg dishes. Remember to undercook the dish slightly and allow a standing time to finish the cooking process.